Call me sentimental, but I always viewed velcroing fluffy sheep to the cloth stable, singing Christmas carols (in the Witkowski well-intentioned but very off key manner), and lighting green candles to be some of the many things that make Christmas the most wonderful time of the year. Even as an unbelieving kid, I found that there was just something right about celebrating Jesus at Christmas. For all its overuse and misuse, there really is something to the expression: “Keep Christ in Christmas.” Today as a parent, I still think Christmas is one of the best times for emphasizing Christ in our homes. Now, I also know that Christmas is almost here. (I.E. : roughly six days, 12 hours, and 58 minutes for us last minute shoppers) However, there is still plenty of time to focus on the Christ child this Christmas season. 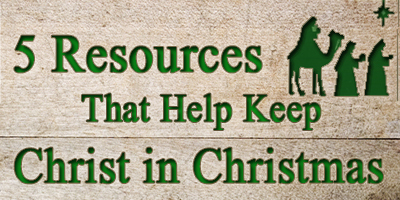 Below, I have put together a list of some of the best resources available for connecting our hearts and our kids’ hearts to the true meaning of Christmas. Designed around nativity scenes, lighting candles and scripture, the book is wonderful, new resource with a traditional feel. The devotions are built on the Biblical Christmas story and also are tied to the compelling story of thieving orphan. In addition to being biblical and easy to understand, the devotions are also infused with object lessons and Christmas carols. Marty Machowski has helpfully planned out your family’s Christmas devotions. These thoughtful two-three page devotions are gospel packed and will make you think. My wife and I have been reading this little book together. It has proved to be an encouragement to my soul and has helped to keep the Christmas story fresh. The devotions are not directly tied to Christmas carols or the traditional advent wreath. But as devotions, I have found none better. This is a great resource for those on the go and with older children. Very similar in style and to Good New of Great Joy, this book focuses more on the secondary or theological texts of Christmas looking at Acts, Hebrews and the Pauline Epistles. It is a great resource, highlighting the beauty of our savior in short, two to three page devotions. If you want to encourage your heart to love Jesus more this Christmas, I recommend that you delve into this little treasure. Do you know? If you answered no or if your kids have questions about the origin of Santa, gift giving, caroling and a host of other Christmas traditions, you should join Buck Denver for his Christmas party. Produced by the creator of VeggieTales, this almost hour long DVD is filled with puppets, songs, and animations that will help us all focus more on the Christ child! ← What Do We Tell Our Kids About Santa?